Frank Casino will then reward you with a bonus (Welcome Bonus is for new players only). The terms and conditions of the bonuses vary between different casinos and might also change over time and between different countries, so it is important to compare the different offers and read the T&C for Frank Casino before signing up. If a massive choice of casino games is what you’re after, head to Frank’s and prepare to get impressed with more than 1,500 options to pick from. 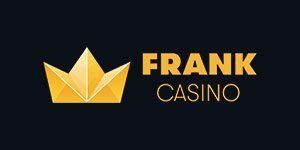 Frank Casino was established in 2014 and in relatively short period of time managed to build a portfolio not many can match. The team has decided to source products from no less than 35 different software developers and let you choose your welcome gift – either Free Spins, loyalty points redeemable for cash, a deposit match or a cashback. The Casino is operated by Cyprus-based Sunlet Services Ltd and licensed in Curacao. No matter what you’re looking for, chances are Frank has it. You’ll find mega brands like NetEnt, Microgaming, Nyx, BetSoft and Play ‘n GO, followed by popular Yggdrasil, Quickspin, Big Time Gaming, Lightning Box, Blueprint Gaming, Rabcat, 2×2 Gaming, Playson, Booming Games, Amatic, 1×2 Gaming, Chance Interactive, Push Gaming and Genesis Gaming, and less frequently featured Endorphina, RedRake, Side City, Red Tiger, August Gaming, Habanero, Fantasma, Foxium, JFTW, Old Skool Studios, Triple Edge Studios and AdoptIt. An impressive lineup of developers results in an impressive library which counts over 1,500 casino games instantly playable in your web browser. Even with predictable shrinking, mobile site accessible via iPhones, iPads, Android devices and Windows Phone will still offer tons of options for getting entertained while on the move. With a library of this size, it may be difficult to decide where to start. If you access „hot“ titles, you’ll find the likes of Immortal Romance, Big Bad Wolf, Bonanza, Girls With Guns, Vikings Go Berzerk, Esqueleto Explosivo and Dead Or Alive. Section storing new games will give you instant access to interesting new releases you may have not seen yet, such as Chicago Gangsters by Playson, Street Magic from Play ‘n GO and Quickspin’s BigBot Crew. You’ll also find little gems such as Cuckoo by Endorphina, a beautifully designed video slot with Scatter-activated Clock Bonus game. It sets the alarm clock at a random time (unknown to you) and prompts you to move the hand in order to get a multiplier. The farther you move it, the bigger is the prize, but there’s always a risk alarm will go off and end the bonus round. If you’re lucky, this feature could win you a maximum multiplier of 2,400x. Jackpots section offers a dozen opportunities to win massive amounts in a matter of seconds, the most tempting one being Mega Moolah. Frank Casino features one of the largest table game libraries you’ll have seen, with almost 100 different games to choose from. There’s European, French, American, Chinese and Astro Roulette, plus a large number of Blackjack variants. If a standard one doesn’t excite you any more, try Hi-Lo, Perfect Pairs, Big Five and Bonus Blackjack, or unique Sonya Blackjack which is a hybrid of an RNG and live game. One can alternatively play low or high limit Baccarat, Casino Hold ‘Em, Poker 3 Heads Up Hold ‘Em, Caribbean, Ride ‘Em or Oasis Poker, Beat Me, Odd One In, Red Dog, Three Card Rummy, Race The Ace, Poker Dice and Money Wheel. If you want more, you’ve got it! Frank additionally provides 30+ Video Poker games, among which Aces & Faces, Deuces & Jokers, Five Draw Poker and Split Way Royal. A separate section stores more than 60 other games including Scratch Cards, Bingo, Keno, virtual sports, arcade-type games, Sic Bo and more. Evolution Gaming and NetEnt have jointly equipped Frank’s Live Casino with 50+ tables manned by engaging dealers and featuring different bet ranges. There are multiple Roulette games, including rarely seen Live American Roulette, plenty of Blackjack tables and a Casino Hold ‘Em table. Fans of Baccarat will be spoilt for choice with an offer of standard game variants, Speed, Squeeze, Control Squeeze and Dragon Tiger. To make payments as convenient as possible, Frank has decided to embrace popular debit/credit cards (Visa, Visa Electron, MasterCard, Maestro) and eWallets (Skrill, Neteller), along with Trustly, Sofort, Nordea, ecoPayz, Giropay, Entropay, POLi, Klarna, Boleto Bancario, Eps, iWallet and PaySafeCard. Most of these will enable you to fund your casino account with as little as €5 and a maximum of €500 (€2,000 with cards and eWallets). Players can cash out between €5 and €2,000 per transaction if using debit/credit cards, €25 to €2,000 with Skrill, and €50 to €2,000 with Neteller. Either way, they’ll be limited to a maximum withdrawal amount of €100,000 per month. Frank’s website either has no FAQ and Contact sections or else we failed to find it, but in any case, the result is the same – a lot of questions left unanswered. Though there is a Live Chat icon floating on the left-hand side of the screen and Frank claims its support team is available 24/7, we’ve not managed to start a conversation.